In the 1980s, I liked the odd bit of middle-of-the-road music as much as anyone. Phil Collins, Toto, Chicago (who we saw on my 1985 flashback this week)... it was a great era for soft rock and power ballads. But, by 1990, either my taste had moved on or they just didn't make them like they used to. This week in 1990, three of the new entries on the ARIA singles chart were what radio programmers would describe as MOR. I only liked one of the songs, and even that wasn't as good as the previous singles by the band in question. Talk about hard to please. I was also not that pleased that there was no change at the top of the chart this week as "Nothing Compares 2 U" proved unassailable for a seventh week. The good news: it was the single's second last week at number 1. Labour Of Love II really wasn't off to a good start for UB40, with this cover of the 1973 single by Al Green flopping worse than "Homely Girl". It'd do much better on re-release in 1991. Perhaps LRB should've gone out on a high with 1988's "Love Is A Bridge" and the Monsoon album. Instead, this almost title track from the Get Lucky album ended things with more of a whimper. I hadn't minded breakthrough hit "Blush", but this re-release of the jangly guitar band's 1987 debut single just served to show far they'd come in the years since. Monotonous. If you click on the clip from Top Of The Pops below, you'll hear the presenter introduce this breakthrough rave hit by the Manchester dance act as "Pacific 707". 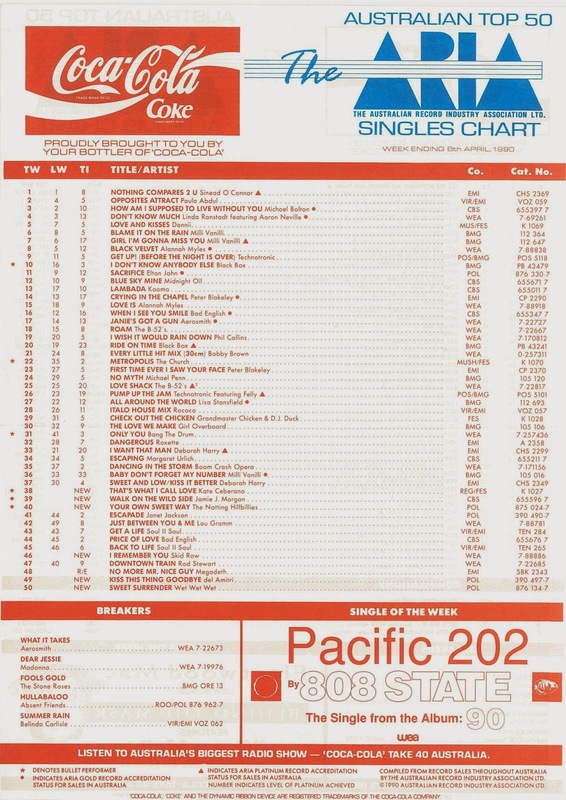 So why was it listed on the ARIA chart as "Pacific 202"? And why is it also known as "Pacific State"? Well, there are actually dozens of different versions of the track, which started out as "Pacific State" on the band's debut EP, Quadrastate. Remixed for single release, the 7" version was known as "Pacific 707" and the main 12" version as "Pacific 202". It's the latter that was released - and charted - here (and you can here it by following the link in the song title above). But, although Australia had embraced the likes of Technotronic and Black Box, this piece of instrumental club music was clearly too out-there for local palates. The time's they were a-changing for Scottish quartet Wet Wet Wet as they continued their transition from perky pop pin-ups to long-haired balladeers beloved by mums the world over. "Sweet Surender", the lead single from the Holding Back The River album, was a crucial step into more adult contemporary music. The type of slick ballad that wouldn't have sounded out of place on a Simply Red album, it was easily their biggest hit up until that point in Australia and their fifth top 10 hit in the UK. And, although I liked it, I missed the days of "Sweet Little Mystery" and "Wishing I Was Lucky". After "Sweet Surrender", the band's success stalled, with a string of singles following in its wake that did very little either here or at home. The next time we'd see Wet Wet Wet on the ARIA top 50, they'd be well and truly middle of the road. 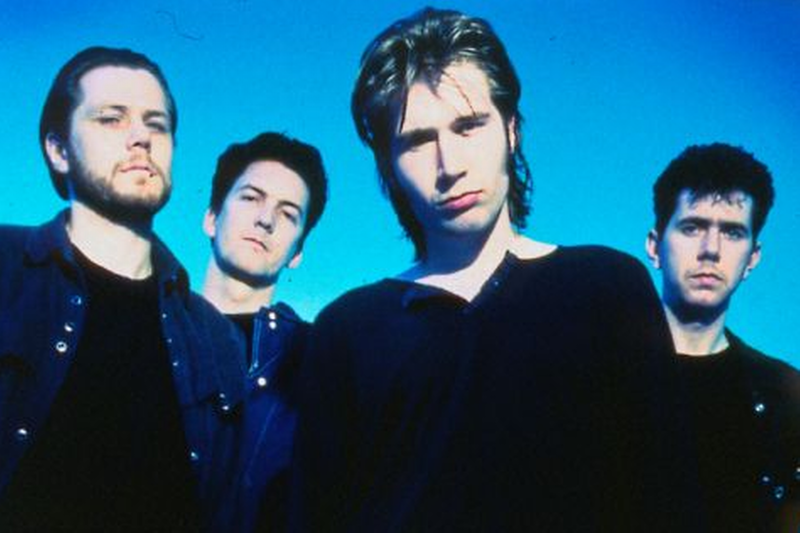 More MOR music from Scotland now, with the debut single from five-piece Del Amitri, who were more Texas than Simply Red - and even hailed from the same city as Sharleen Spiteri's band: Glasgow. Even more so than with Wet Wet Wet, I couldn't help but focus on the hair on display in Del Amitri, specifically the humongous sideburns sported by singer Justin Currie. Quite the distraction. Not as big a hit as my memory would've suggested, "Kiss This Thing Goodbye" did spend quite a while on the top 50, not reaching its peak position until mid-June. Next up, another band with noteworthy hair - and although Skid Row singer (and future Gilmore Girls guest star) Sebastian Bach's lovely blond locks might have suggested that he was just the latest in a long line of pretty boy hair metal frontmen, his band's music was less Warrant or Poison and more Guns 'n' Roses. Indeed, "I Remember You" was the sound of mainstream American rock music getting more earnest and grungy - and consequently less fun. Wow, it really was a week for depressingly dull soft-rock, wasn't it? With Dire Straits still resting on their laurels after the all-conquering Brothers In Arms album, singer Mark Knopfler and keyboardist Guy Fletcher kept their hands in as members of this side-project. To me, The Notting Hillbillies felt like a poor man's version of The Traveling Wilburys - and I'm sure this sleepy single wouldn't have received half the attention it did without the band's high profile members. I was about to say, "Finally, a decent song..." until I listened to this cover of the classic Lou Reed single from 1972 for the first time since 1990 and, well, this version is pretty terrible. The "Buffalo Stance"-style production works, but Jamie's delivery is kind of embarrassing. Not surprisingly, Jamie has a musical link to Neneh Cherry - he was formerly one-half of Morgan McVey (with Cameron McVey), whose single "Looking Good Diving" featured an early version of "Buffalo Stance" as its B-side. Finally, a decent song! And, if I'd been making decisions about what to release from Brave, this would have followed "Bedroom Eyes" as the album's second single. I also would have got Kate to shoot a proper music video for it. Unfortunately, when "That's What I Call Love" finally did come out, it felt like a bit of an afterthought. Next week: one of the biggest singles to emerge from the Madchester scene hits the chart, and Belinda Carlisle finally breaks that one top 10 hit per album curse. Music can be educational. I'm pretty sure the Hummingbirds track was my first exposure to the word 'alimony'. It's odd how the UB40 single flopped so badly upon initial release, then became a major hit once it took off in America. I liked the Wet Wet Wet track at the time, but something about it kind of irks me now. 'Goodnight Girl' (the original 1991/2 version) was probably my favourite track of theirs. 'Kiss This Thing Goodbye' oddly charted better here than in the UK. I liked it, but liked their subsequent release even more. This one's great 'drive in the country' music. I preferred the predecessor flop singles '18 + Life' and 'Youth Gone Wild' to 'I Remember You', but can see why this was the much bigger hit. Something like the Notting Hillbillies' track would never dent the singles chart now. I hadn't heard, or even heard of, it when it debuted in the top 50 on rage. It's tolerable in its own morose kind of way, but I still can't believe anyone actually went out and bought the single. Surely nobody under the age of say, 25, would have bought it. The vocals on the Jamie J. Morgan track are a bit... underwhelming, but I still like the musical backing. I thought that the black women singing back-up were Salt 'N' Pepa at the time, but they aren't. Incredibly, this version was a #1 hit in New Zealand. I like 'That's What I Call Love', but don't care for the live version used for the video at all. I guess she wanted to prove she was a 'real' singer by using it as the video. I'm amazed you didn't mention Dear Jessie as a breaker despite falling from #51 to #53 this week! Ha ha, I did actually think to look it up what position it was this week (suspecting it might have fallen), but then didn't. How strange it was still included as a breaker, though stranger things have happened before (e.g. Rick Astley's 'Take Me To Your Heart' listed as a breaker 2 weeks after it fell out of the top 50). Maybe 'Dear Jessie's sales increased this week, despite falling 2 places? Still, it was an odd decision to include it if so.